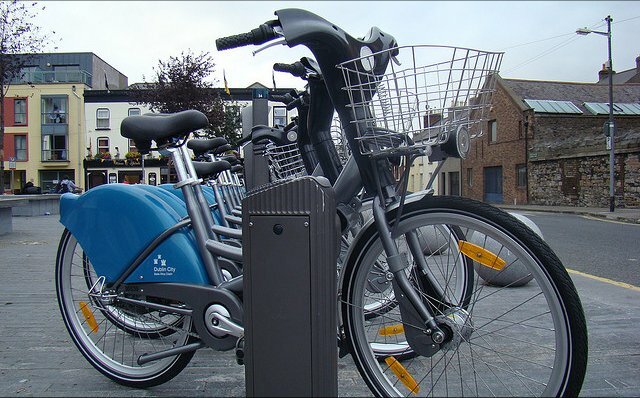 A Fine Gael councillor has complained that the construction of a DublinBikes station off the South Circular Road is resulting in the loss of on-street parking. Work is continuing on doubling the amount of stations in Dublin’s on-street bicycle sharing system. “I’m in favour of the scheme, but Dublinbikes have said all along that if residents were going to be severely inconvenienced by the bike stands, they would look at their location again,” Cllr Clare Byrne was quoted as saying last week in the Herald newspaper. The location of the station in question at Rothe Abbey, a cul-de-sac off the South Circular Road, was known to city councillors since at least May 2013. After the expansion was announced, residents across areas of Dublin not included were left wondering if DublinBikes will ever come to their areas. But the Herald calls the Rothe Abbey location in Dublin 8 “a particularly contentious depot site” as nearby apartment residents do not all have off-street parking. Seven new stations have opened this year so-far. These include at Hanover Quay, Grand Canal Dock, North Wall Quay at the Point, North Wall Quay at the site of the planned New Central Bank (aka Anglo HQ site), Benson Street (between Hanover Quay and Sir John Rogerson’s Quay), Denmark Street Great (off Parrell Square) and Lime Street (off Sir John Rogerson’s Quay). The seven stations going live follows 17 coming on-stream late last year. Read more about DublinBikes on our dedicated DublinBikes page and check out all the planned locations of stations on our interactive map. While the expansion has so-far focused on the Docklands, stations are now under construction on the west side of the city centre including off the South Circular Road and off Thomas Street. They forgot the new Station just put in on Francis Street outside the Iveagh Market ,still working on it. Also the one just put in on Deverell Place on Lwr Gardiner Street. Wee need lots more Bicycle Parking for ordinary Bikes they just seem to be ignoring this problem now in favour of Dublin Bikes. Lots of Bicycle Parking are badly needed on O’Connell Street also around the St Stephen Green area and South Georges Street area. In fact anywhere in the Metropolitan area of Dublin City ,loads more Bicycle parking is needed. Get rid of more Car Parking and replace them with Bike Parking.